Close to 500 members of the Cathedral Prep community gathered on Sunday afternoon, October 4th, at Gargiulo’s Restaurant in Coney Island, Brooklyn, NY, to celebrate Cathedral’s illustrious history. 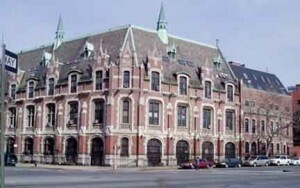 Cathedral Prep was established in 1914, and is proud to call over 4,500 men graduates. 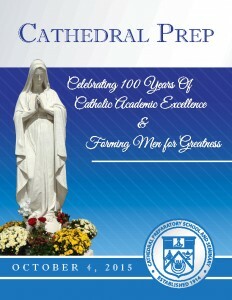 Cathedral continues to offer young men from the greater New York Area a personalized, superior education. Fr. James Kuroly, ’98, opened the afternoon with grace, followed by a champagne toast delivered by Bishop Paul Sanchez, ’66. The sell­out crowd watched a video presentation on Cathedral produced by Alum Tim Harfmann, ’10, assisted by DeSales Media, under the leadership of Msgr. Kieran Harrington, ’89, and Ed Wilkinson, ’65. Bishop Nicholas DiMarzio thanked all for joining together to help celebrate Cathedral. 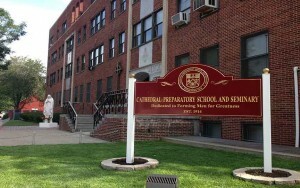 He spoke of the great past and present work at the Prep and asked for continued support and prayers. Nino Russo and his staff at Gargiulo’s hosted a wonderful cocktail hour, featuring seafood and carving stations, and an outstanding meal followed by a beautifully decorated cake and coffee. After dinner, two of our Men of Greatness, Alums Father Chris Bethge, ’07, and Steve Somers, ’78, gave testimonials of the academic and spiritual foundations they received while at the Prep. Fr. Joseph Fonti, ’84, Rector­-President, spoke of Cathedral’s history and mission. He thanked the loyal alumni and benefactors for their past and continued support. Father acknowledged and awarded former and present Rector­Principals and Faculty with the Immaculata Award for their service and dedication to Cathedral. Next, Fr. Fonti and Principal Richie Diaz, ’96, made a special floral presentation to Administrative Assistant Fran Heaslip, who is retiring after 31 years at the Prep. For 100 years Cathedral has stayed faithful to its mission: to form the mind in the ways of academic excellence and the heart and soul in the ways of heroic virtue and belief. Whether Cathedral graduates don the vestments of pastoral service as priests or deacons, or devote themselves to raising Catholic families, men who experience the Cathedral spirit are ready and willing to be a man for greatness. The 100th anniversary event was a great success thanks to the event sponsors, dinner attendees, and donors. Thanks to the Cathedral Prep community, who helped celebrate 100 years of academic excellence and forming men for greatness, and set the path for the next century of future Catholic leaders of the Church. Please click on the following videos, the first video has pictures from the Gala and the second is a video that was showed at our gala produced by Tim Harfmann, ’10.